Description: Reuniting all EPS/non-EPS workers in South Korea & to other countries as well. Sharing ADVICES, OPINIONS & HELPING one another especially on work related issues. Description: THIS GROUP IS OPEN TO ALL OVERSEAS FILIPINO WORKER’S IN SOUTH KOREA,AND OTHER COUNTRY..TO PROMOTE THE UNITY,INTEGRITY, HOSPITALITY OF ALL OFW…..A FILIPINO HERO.. I am not a member of this group so I don’t have an idea of their posting. Description: It aims to provide everyone the information we need in South Korea and in the Philippines in terms of various aspects. One of its missions is to reach-out to every Pinoy in South Korea and promote Filipino Culture, World-Class Pinoy Products and everything that is truly Pinoy. Membership is a mix of Filipino workers, married immigrants, Filipinos in other countries, and even non-Filipinos. Postings range from housing ads, blog postings, viral videos, job ads among other things. Description: The official Facebook group of the Embassy of the Republic of the Philippines in Seoul. 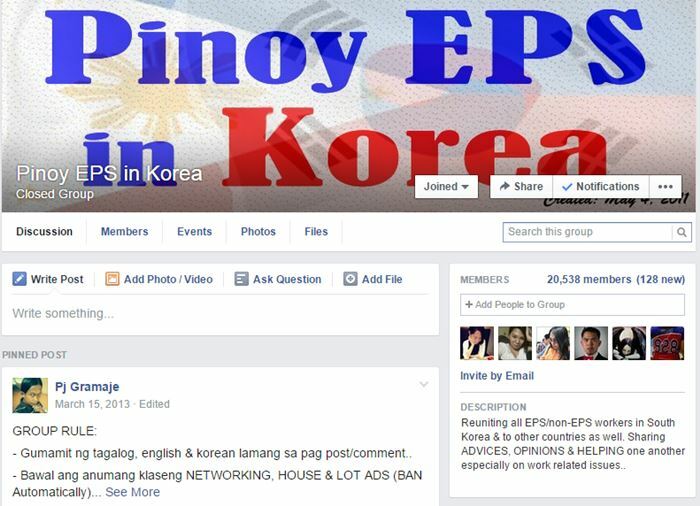 Any Filipino living in South Korea is free to join the group. Find official announcements of the Philippine Embassy in Seoul in this group. If you have queries regarding advisory posted on the Philippine Embassy’s official website, you could post them here. Do you have a question about passport renewal? You might find the answer in this group. Description: KFCENTS aims to create and organize a variety of events for all Filipinos and other foreigners residing anywhere in Korea. We would like to serve everyone; MENS, WOMENS, & CHILDRENS by organizing fun-filled events with the help of our selected and dedicated sponsors. Everyone are welcome here…Kaya join na kau! There are daily postings but not much active discussions. Much of the postings are inspirational quotations and viral articles. Description: UFILKOR (United Filipinos in Korea) formerly known as UPIKOR ( United Pinoys in Korea) was organized on February 19,2010, through the collective efforts of the Philippine Embassy (thru the former Consul -General Sylvia Marasigan), the Seoul Global Center and the different Korean-Filipino organizations. I am not a member of this group so I don’t know have an idea of what the postings are in this group. I just buy them online but you can try the beauty supplies store in Myeongdong and Dongdaemun.